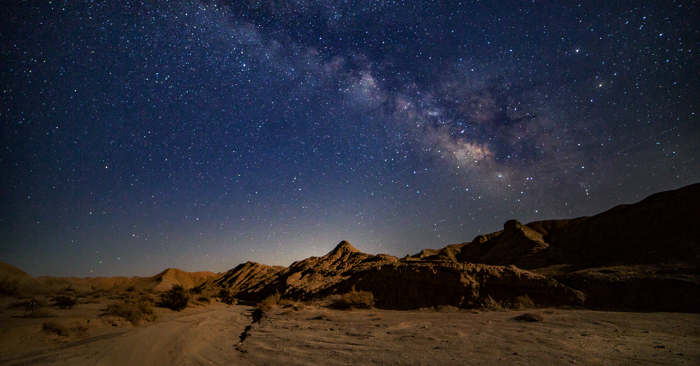 Anza-Borrego Desert State Park in southern California, U.S., has long been considered a premier site for stargazing, and today it cements that reputation with the announcement that IDA has designated it as an International Dark Sky Park. Anza-Borrego completely encloses the village of Borrego Springs, California, which achieved International Dark Sky Community status in 2009. Together, the park and village work in tandem to protect dark night skies over the southern California desert. Anza-Borrego’s commitment to protecting and interpreting its dark night skies was a factor in IDA’s official designation as a dark-sky park. The designation as a Silver-tier park recognizes the dark skies over most of the park, while acknowledging the presence of relatively small domes of light pollution near the horizon, from the surrounding urban areas of Los Angeles, San Diego, Palm Springs and El Centro. Anza-Borrego Desert State Park is situated in a ‘pool’ of natural darkness in the southern California desert, as shown in this map drawn from the New World Atlas of Artificial Sky Brightness (2016). Cooler colors (greens, blues) correspond to darker night skies. Image from lightpollutionmap.info, courtesy of Jurij Stare. In recent years, Anza-Borrego has retrofitted light fixtures and replaced bright white lights with more dark-sky friendly amber lights. The new light fixtures create less light pollution, and have a smaller negative effect on wildlife. Anza-Borrego protects nearly 650,000 acres of desert ecosystem in southern California, and two-thirds of that is afforded extra protection as designated wilderness. In addition to habitat for wildlife, the park serves as a refuge for humans too—offering expansive vistas, quiet solitude, and stunning night skies filled with stars. Residents of San Diego or Palm Springs can reach the Park in two hours or less, and for those coming from the Los Angeles area, a 3-hour drive brings them to a completely different world! 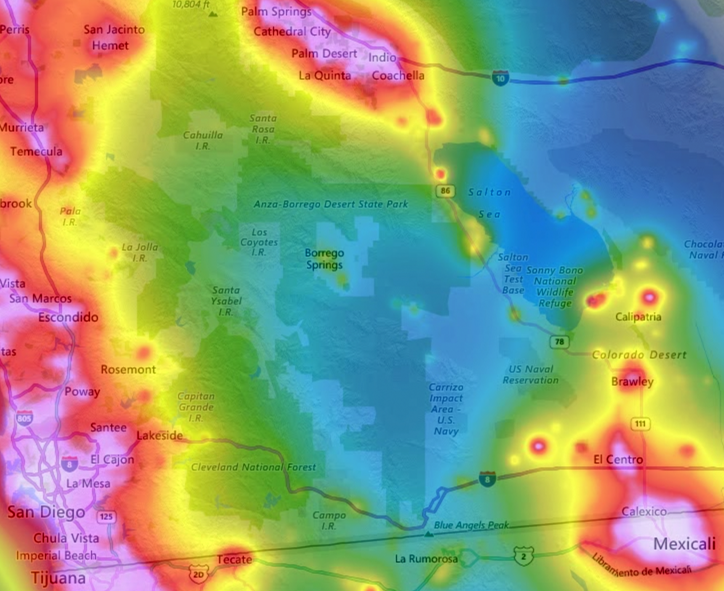 A glance at any map of light pollution in southern California reveals that Anza-Borrego is truly an oasis of darkness, easily accessible to the millions of people who live in these metropolitan areas. Anza-Borrego offers regular night sky interpretive programming. Monthly stargazing and moon-watching programs give visitors opportunities to learn about features of the night sky, the importance of darkness, and the steps the park is taking to protect dark skies. A stargazing event is scheduled for 20th January, a campfire event to learn about lunar eclipses is set for 27th January, and a moonrise event is set for 31st January.